Recently I showed you our updated Master Plan. The biggest changes were the final selection of a location for a goat barn which connected to two pastures for the does. 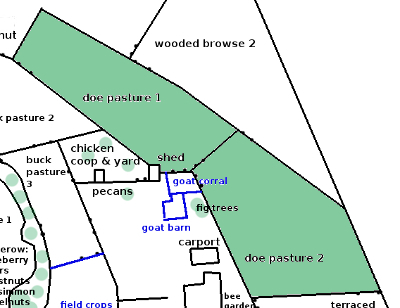 Goat barn and goat corral are in blue, indicating they are planned. Pasture #2 was used for growing corn, cowpeas, mangels, and wheat, although doing so has always been a struggle. It was the one area that wasn't kept up when the house was empty and the property not in use. This field is infested with kudzu, brambles, pine and pecan saplings, nightshade, and morning glory, to name a few. We've turned the goats in several times a year, also the pigs, but the stuff always grows back. When we finally decided to move the field crops to another area, we got to work on turning proposed pasture #2 into a reality. Recently I was finally able to let the girls in for the first time. First Dan disked it thoroughly, and then we limed and planted. It's a mix of every kind of pasture grass, herb, root vegetable, and legume for which I had seed. (This is a good way to use old garden seed such as peas, parsnips, turnips, and amaranth). Goats love variety and this is a way I can provide that. I used the same modified Fukuoka method that I showed you last October; covering the seed with a light mulch of goat barn cleanings. The biggest challenge was keeping the chickens out. They love seed and they love straw! 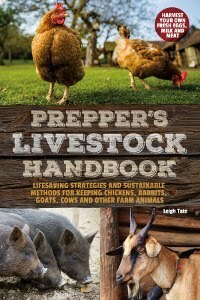 If you've read Critter Tales, then you know all the problems I've had and what I've tried to do to get the chickens to stay put! This time I extended the fence around the chicken yard by tying on a two-foot tall roll of chicken wire. It is now roughly six feet tall. 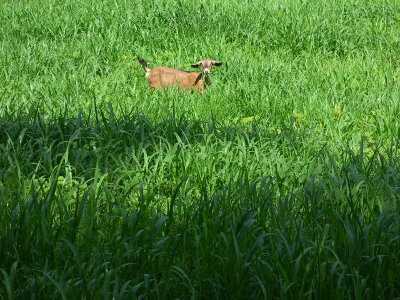 the newly planted buck pasture (#2 on the Master Plan). 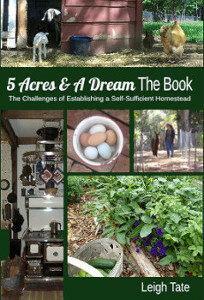 The chickens had to stay in their yard until the seed had grown into goat forage. After planting, everything depends on rain. Rainfall is unpredictable this time of year, but we got enough to get a start on growing. I went back and reseeded the bare spots and waited until that seed started to grow before letting the goats in. 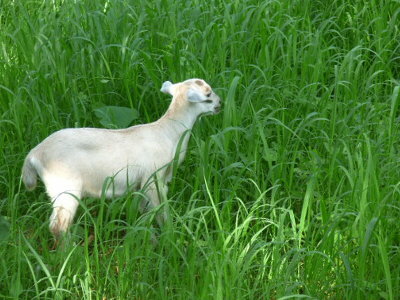 Because the forage is new and rich, the goats have to be introduced to it slowly in order not to upset their rumens. Too much too soon could result in bloat, which can be kill them. (It can also cause soft, clumpy poops.) I started by feeding handfuls in their evening ration, gradually increasing, then gave them short grazing times (15 minutes the first few days, then 30 minutes, then 45, and so on.) The trick to getting them to come in when their time is up is to turn them in right before their evening ration. They don't want to miss out on that so they come when they're called. sometimes lose their moms. Then the hollering begins. Love it! Working slowly to the same goal. This year just let what came up come and there was plenty since Nor. Cal got a generous amount of rain finally. Will look into planting in the Fall. The new pasture looks great! 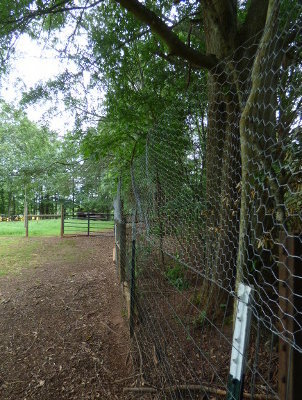 Good luck with keeping the chickens out of it, your beefed up fence looks up to the task. It is amazing how loudly a kid can scream! I used to think those TV commercials were made up until I heard the alert coming from my smallest doe! I am opening up a new area of my land to the sky. It has grassed up over the last three years just by virtue of the sun hitting long dormant seeds. No one likes that kind of grass, so I am planning on overseeding it with my pasture mix and hoping for the best. I have a lot of bare places. The next thing: post holes. I am finally fit enough to dig post holes. I need to put in the corners of my pastures. H-Brace 101. You two give me inspiration! 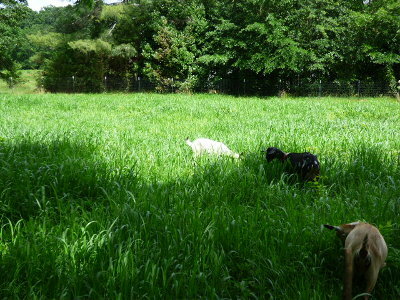 My goats have the job of clearing their own paddocks (I have such a small piece of and, I can't call the browse areas "pastures") - I do the fencing and then they do the rest of the work. I wish I had the room to create real pasture like you folks are doing. You are well on your way to your goal! That pasture looks like every goat's dream... at least I imagine it does. You use of a master design plan shows how it keeps ideas focused! Our design is developing as we learn the soil, runoff and growth patterns of this area. Do goats need more browse? Great acclimation plan to work them up to eating an abundance of fresh greens. Curious about the nightshade, will search here for another post on it. That rainfall for you all was such wonderful news. I hope it continues! A good fall planting and winter pasture would be wonderful. Oh those chickens! They've also do a number on my permaculture hedgerow when I put new trees and shrubs in. They continually unmulch everything! I like that term paddocks too. We call ours pastures, but at only 1/2 an acre, I don't know if they are truly pastures. The browse areas are simply browse! No matter the size, I think rotation is key, and that's something we haven't been truly successful at. Hoping to do better now. Yes, that master plan is our best tool. Goats are really browse animals. They prefer weeds, shrubs, and small trees to grass, and are healthier on them. That's why they make good "scrub" animals. A large wooded area would be perfect. The trouble is that browse is slow to grow. Pasture grasses and legumes are faster growing so it ends up being easier to keep them fed on that. None of the nightshades are good for them including tomato and potato plants, although they can eat the tomatoes and potatoes. The deadly nightshade is nasty because it's thorny and tenacious. I pull it out by the roots to keep it from going to seed, but I can never get the whole plant - some little bit of root stays and keeps on growing. It's a battle. Your pasture looks great! We have an ongoing battle with bindweed and thistle. Those thistles are tough as iron! We've tried chopping them and trying bleach, vinegar and salt, but back they come. Looking forward to seeing your other projects! That picture of the kid lost in grass is so adorable. I have never heard a goat start hollering. I think I am missing out. Wow! How on earth do you know all this stuff? I am always amazed at how much I learn each time I visit your blog!! Although I don't have a farm, I live in South Florida and try to grow native plants in my back yard for wild animals, birds and butterflies. Someone had morning glory growing here before we came and it is impossible to get rid of, especially since there is no freeze here. I'm forever ripping it out. I can sympathize - when I read you had Morning Glory vine I was instantly sympathetic.